This stir-fry recipe has a few more components than the average chicken-and-vegetable offering. But I think you’ll be thrilled with the unusual flavor and texture of the dish. Any extra effort required will pay for itself tenfold in satisfaction…I guarantee it. The shrimp and mango are served over fried wonton strips— find them in the refrigerated section of the produce aisle (the jarred mango is in the same area!). The strips hardly take any time to make, but if you’re not up for frying, steamed rice is great too. Fry egg roll wrapper strips in 1 inch peanut oil in a nonstick skillet over medium-high heat to make wonton strips. Cook strips in batches until light brown and crisp, about 1 minute. Transfer wonton strips to a paper-towel-lined plate and season with salt; fry remaining strips. Pour off all but 3 Tbsp. oil. Combine garlic, sesame seeds, 1 tsp. salt, pepper, and pepper flakes in a dish. Toss shrimp with cornstarch. Stir-fry shrimp in the 3 Tbsp. oil in the skillet over medium-high heat 2–3 minutes per side. Stir garlic mixture into shrimp and cook 1 minute. Add mango juice and lime juice; bring to a simmer. Stir in mango and scallions, cooking just to warm the mango. 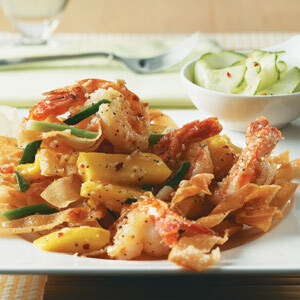 To serve, divide wonton strips between four plates; top each with mango mixture and 5 shrimp. Serve shrimp with Cucumber Salad. The oil should be very hot when frying the wonton strips. If the oil isn't hot enough, the strips will soak up too much of it. Combine the garlic and seasonings, then add them to the shrimp in the skillet; cook 1 minute to mellow the flavor of the garlic. Add the mango and lime juices to the skillet, then stir in the chopped mango and scallions. Cook stir-fry just 1 minute more.